After waking up yesterday morning and putting on a sweater in hopes of cool-weather cozies (I think grown ups call that “hygge” or something?) only to melt like the Wicked Witch of the West in the sun and heat by the afternoon, I think it’s safe to say that I’m ready for fall. Other signs that I’m ready? I’ve pulled my leather boots out of storage. I smile like a doofus at the changing leaves on trees. And I’m going to town on this Pumpkin Spice Puff Cereal on the daily. It happens, like, once a year but I am very much on a cereal kick these days. Forget the peanut butter toast or the scrambled eggs (my usual go-to breakfasts): I am all about the classic breakfast in a bowl. But since I’ve pretty much bought out the entire cereal aisle at the grocery store of their Oatmeal Squares (ummmm have you had those? They’re amazing), I figured it was time to give my palate something new to crunch on in the morning. Enter this delicious homemade pumpkin spice cereal. You guys, I love this stuff. 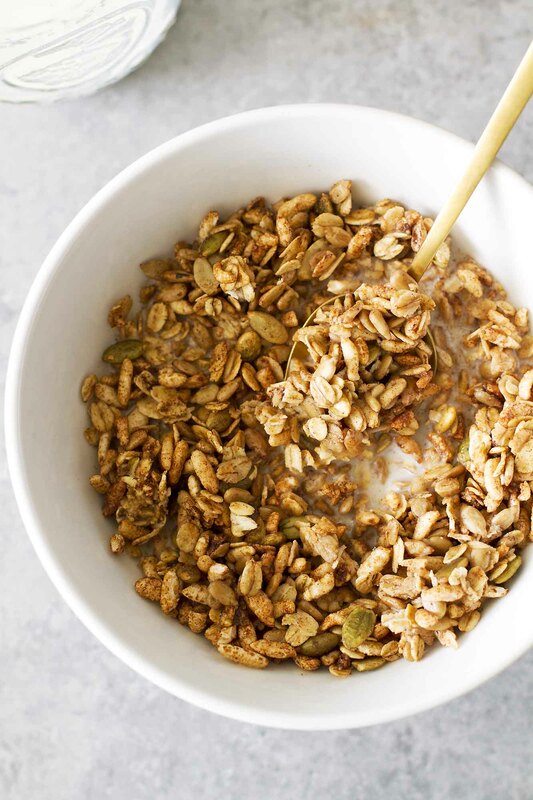 It’s halfway between granola and cereal, with puffed rice and hearty old-fashioned oats, and the sunflower and pumpkin seeds (I think grown ups call them “pepitas”) add a wonderful crunch. Then you add pumpkin spice, cinnamon, ginger, sugar and salt, some maple syrup and coconut oil, bake it all in the oven until it’s golden brown and fragrant like a pumpkin spice candle in your kitchen and just like that, you’ve made homemade cereal. Sometimes I add golden raisins or top it off with fresh fruit for sweetness. And every time I eat it, it brings me instant fall cozies. I also love that this recipe makes a big batch and that you can store it for weeks at a time, so you only have to make it, like, once a month and you’re set for a good long while. Unless you eat as much of it as I do — in which case, maybe a double batch is necessary. As with all of my favorite recipes, this one is extremely versatile. 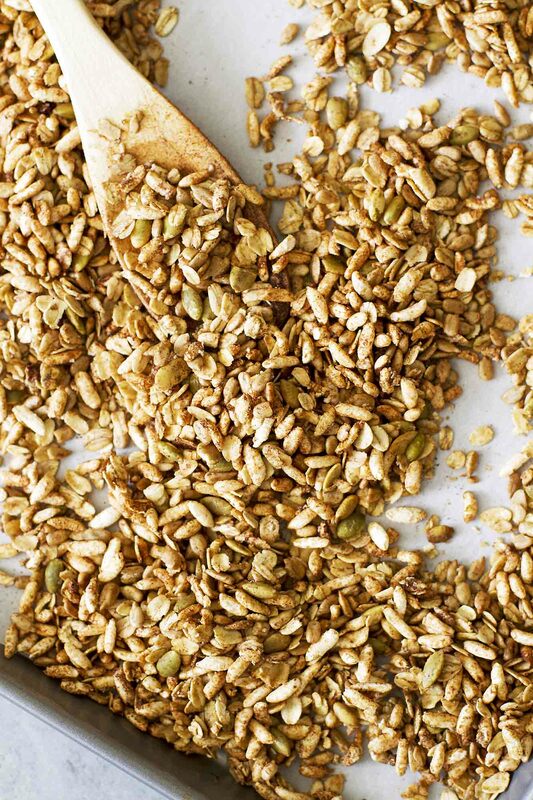 Swap the amounts of sunflower seeds and pumpkin seeds, adjust the seasonings to taste, add more sugar if you like it sweeter, the list goes on. You can also serve this cereal warm! Just heat it with milk on the stove or in the microwave for a minute or two until warm. So while the weather here might not agree, I’m in full-on fall mode over here. Definitely gonna wear a sweater today, too. Heat oven to 350 degrees F. Line large rimmed baking sheet with parchment paper or spray with oil. 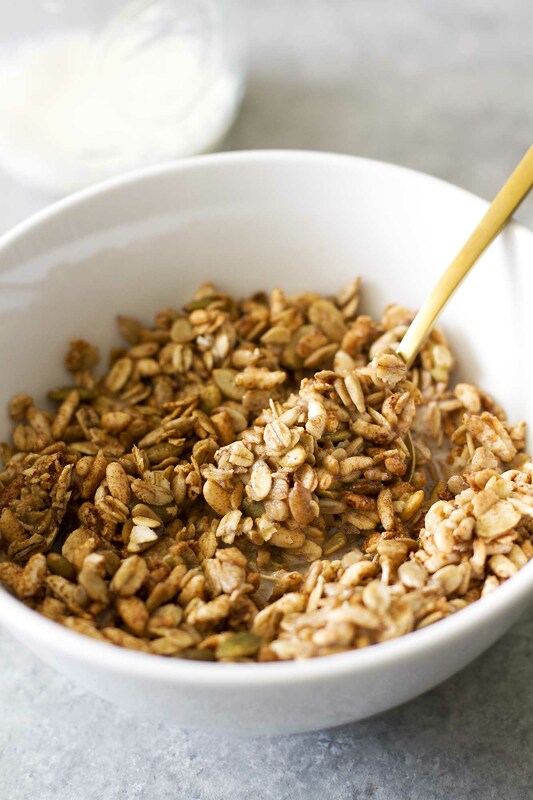 In large bowl, stir puffed rice cereal, oats, sunflower seeds and pumpkin seeds to combine. Add pumpkin pie spice, sugar, cinnamon, salt and ginger. Stir until well combined. Stir together maple syrup and coconut oil, then drizzle over cereal mixture. Stir until well combined. Spread mixture in even layer on prepared baking sheet. Bake 15 to 18 minutes, stirring halfway through, until cereal is golden brown. Cool completely on baking sheet. Stir golden raisins into cooled cereal, if desired. Store cereal in airtight container at room temperature up to 3 weeks. I am so ready for fall to start. I tried to wear long sleeves and boots to drinks with friends only to find that it was 80 degrees on Friday. If we all wish for fall hard enough it will come, right? I’ve never even thought about making my own cereal. I love eating it for breakfast, but cereal just doesn’t stay with me for the morning. I bet all the goodies in here help make it both satisfying and delicious. You are so dang creative! I never would have thought to take a cereal that already exists and make it something the cereal companies only wish they had thought of!!!!!!!!!! I’m in the burrito blanket as I type this!!! Time for all the warm, all the cozy, and all the PUMPKIN! PS. Per usual your video is fab! Allyson — I feel your pain! And yes, this cereal is definitely heartier than most, which is a plus. Erin — Welcoming back the burrito blanket over here, too! 😉 Thanks, love! Hello, dream breakfast! Love that pumpkin spice! This sounds like such an amazing breakfast! Pumpkin spice is so good! This looks awesome!! I love the thought of making a homemade cereal! And I am in the same boat with you on the fall. I am dying from heat exhaustion by mid afternoon, lol!